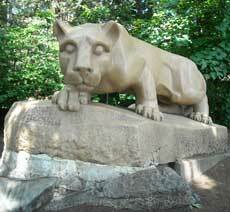 The Pennsylvania State University is a land-grant university founded in 1855. Often called a "public ivy" school, it houses the oldest operating university research reactor, and its law school is the state's oldest. Credit card marketing is restricted at Penn State, according to Rebecca Miller, staff assistant in the school's Office of Unions and Student Activities. She says Bank of America has exclusive rights to solicit on campus. MBNA (which was acquired by BofA in 2005) donated millions to build the Bank of America Career Service Center. "There is a table for the Bank of America in the HUB [Hetzel Union Building], but they don't take credit card applications. When they're here, it's for employment recruitment," Miller says. "When I turned 18, I had all kinds of credit card offers, and I racked up a bit of debt. Now it's all paid off, though. People say, 'Oh, I'm an adult now. I can vote.' But when it comes to financial aspects, most parents are still taking care of them. So I think until students are more settled, [the credit card law is] a good idea. The typical college student is ready to graduate and get a job anyways by the time they're 21. And I understand the argument, too, though -- 'I want freedom.' But once you create debt, you never will have freedom." "Eventually, I'll get another credit card, once I'm convinced that I can manage my money, but I'm going to wait until I'm at least 21 anyways. I would have benefited from it." "My parents won't let me get a credit card. My sister has one and she's 20 now. She hit the max last year and is in debt now."